How Do I Know that is a REAL Service Dog? Today, any pet owner can go online and purchase a service dog vest, and pass their dog off as a service dog in your place of business. The problem is that the proprietors of establishments where people bring their dogs have no way of determining whether a dog is a real service animal. Many businesses, unable to tell fake service dogs from real ones, allow all of them in to avoid getting sued. Many owners of service dogs avoid those places for fear of exposing their animals to danger from untrained dogs. Service dogs, trained to perform tasks for a person with a disability, were first used by people with vision and hearing impairments. Now service dogs are used for wheelchair support or to help with challenges with walking. People with invisible disabilities, like those who are prone to seizures or need to be alerted to medical conditions like low blood sugar, and people with autism or mental illness. The American Humane Association, which promotes the welfare and safety of animals, says there are 20,000 service dogs working in the U.S. today. Because there is no certification or official national registry of legitimate service dogs, there is no way to verify whether a dog has undergone rigorous training to become a service animal. Of course, there is still going to be that handful of people who try to skirt the law, so the best thing that you can do is look for signs that determine whether a dog is actually a service dog. Service dogs are docile and held to “four on the floor,” meaning that all four legs must be on the ground when they are not assisting their owner. If someone is claiming their dog is a service dog, take note of their behavior. If they’re being carried in a bag, trying to greet people, begging for food or making any sort of noise, that’s your cue to inquire about their purpose. The American with Disabilities Act requires all places open to the public, such as businesses, government agencies and entertainment venues, to give access to service dogs and their owners. And, it permits them to ask only two questions: whether the dog is required because of a disability and what tasks the dog is trained to perform. It is illegal to request documentation for the dog or to ask the nature of the owner’s disability. Another complication is now added to the mix: the growing use of “emotional support dogs,” which are intended to provide comfort to those with anxiety or other emotional problems. Some of them may have received special training, although nothing as rigorous as the training for service dogs. Emotional support dogs are not covered under the ADA and can legally be denied access, however, most ESA owners are not even aware of the laws and try to bring their dogs into places of business. 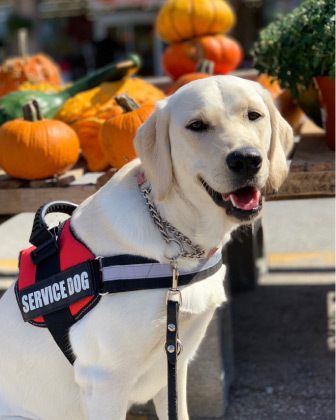 To find out more information on this subject, or train your staff, you are welcome to attend Dometi-PUPS upcoming seminar: Is That Service Dog An Imposter? on April 24. Email info@domesti-pups.org if you plan to attend or have any questions.